JAKARTA, Indonesia (CNN) -- A powerful earthquake struck western Indonesian Tuesday, killing at least 70 people and injuring hundreds more as buildings collapsed. The 6.3-magnitude quake, which was followed by several strong aftershocks, forced thousands to flee their homes near the epicenter on Sumatra island. "We're preparing for the worst," Andi Mallarangeng, a spokesman for President Susilo Bambang Yudhoyono, told CNN. "We are still monitoring the situation ... We hope the worst is over." Power lines and communication were cut to the affected region. 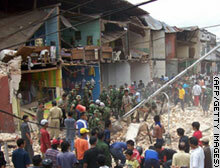 Indonesian television showed widespread damage to buildings on the island, including a hospital that had to be evacuated. The quakes, which were felt as far away as Malaysia and Singapore, sent frightened people running from their homes, Deputy Governor Syamsudin said in the southern Sumatra city of Solok. Peter Cameron of the International Committee of the Red Cross in Jakarta said it was feared that the death toll could rise sharply. He said "tens of thousands of people" were likely to be affected. At least two young children and a teacher were killed when a two-story building crashed onto a playground in Solok, Reuters news agency quoted police spokesman Supriadi, said. "Women were crying out in terror. We all just fled as quickly as we could," Alpion, a welder in the seaside town of Padang said, according to Reuters. Along with thousands of others, he was fleeing to higher ground, fearing a possible tsunami. Authorities said the quake did not cause any tidal activity. Mallerangeng said troops had been deployed to help survivors and hunt for victims while emergency medical supplies were being dispatched to the region. CNN's Kathy Quiano said medics at the scene were struggling to cope with casualties. "Officials are telling us that there are enough supplies for now, but they are appealing for medical help to treat the injured. Many are suffering from broken bones." The U.S. Geological Survey reported a magnitude 6.3 earthquake about 30 miles (50 kilometers) north-northeast of Padang at 10:50 a.m. (0350 GMT). A 6.1 temblor followed two hours later within miles of the first quake's epicenter. Indonesia is the world's largest archipelago and is prone to seismic upheaval due to its location on the so-called Pacific "Ring of Fire," an arc of volcanoes and fault lines encircling the Pacific Basin. In December 2004, a massive earthquake struck off Indonesia's Sumatra island and triggered a tsunami that killed more than 230,000 people, including 131,000 people in Indonesia's Aceh province alone. A tsunami off Java island last year killed nearly 5,000. Crowds gather by quake-hit buildings in Indonesia as rescue workers arrive.